The orchard is planted with a range of rare breed apples including Darcy Spice (an Essex speciality from Tolleshunt Darcy) as well as west country cider apples. We use the apples to make apple juice for sale: the 2017 vintagewill be on sale every Saturday at the Walden Local Food Stall from May 19th onwards. 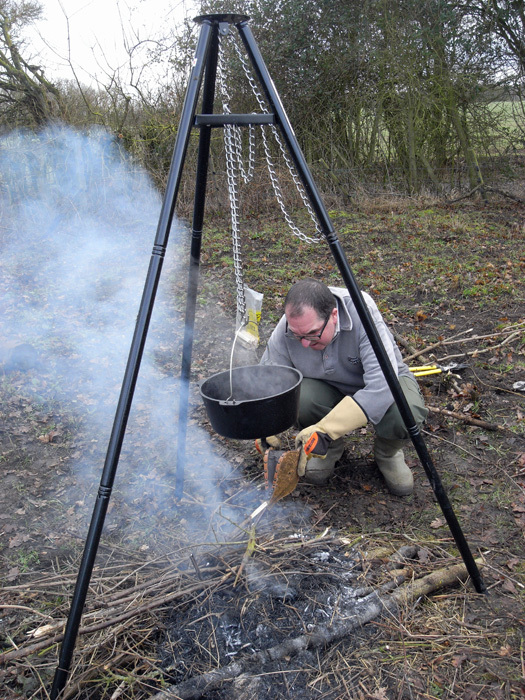 Wassailing is a traditional Essex (and West Country) rite which is said to ensure a good crop of apples in the coming year. It involves sampling some cyder (which we have from Scotch Patch trees), singing a traditional song and blessing the trees. 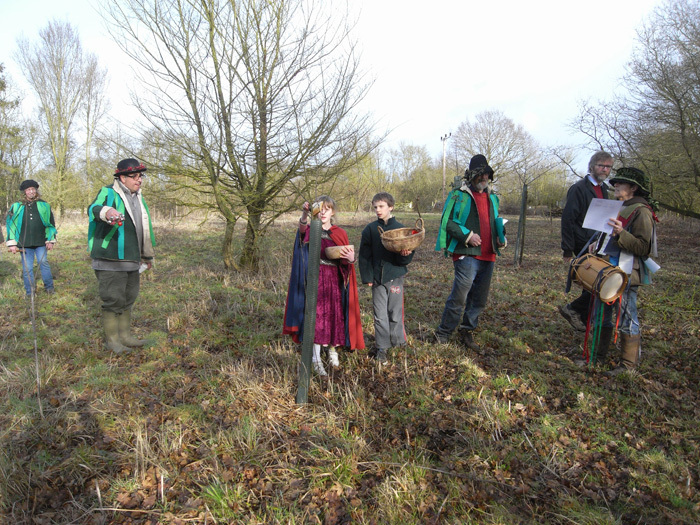 Each year we hold a New Year wassail ceremony at our small orchard at Scotch Patch - Ellis Green. Unlike Noakes Grove, Organic Countryside does not own the land, (Organic Countryside directors Elaine and David CorkeI do) but we have a management agreement. Also the land adjoins Ellis Green Common, which has no known owner, but together with our orchard, forms the Ellis Green Local Wildlife Site. The Wassail was a chance to sample our cider (which we are not allowed to sell) and apple juice (buy yours at the Walden Local Food's Saturday market stall – we've earned over £200 from sales so far). But the most important part of the day was the ancient ceremony of blessing the apple trees: in which the key roles were performed, as tradition dictates, by the youngest boy and girl present. Bernie Horton provided each tree with a slice of toast and Jean Horton poured a libation of cider onto each tree's toast. Great wassailing songs were sung, with David Wrigley in good voice and Jan and Elaine providing the backing group. Let's hope the trees were pleased and do their stuff next season. 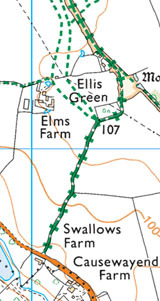 Getting there: a narrow road from the B184 leads to Ellis Green Common where you can park. Ignore the sign, at the B184 end of the road, that says motor vehicles are forbidden: this does not apply to legitimate visitors to Scotch Patch. Sat nav users can enter CB10 2XP to get to Ellis Green.